Hardwar or Haridwar ( Vishnu's gate) is an important pilgrim centre of the Hindus and one of the seven holy places ( Sapt Puri ) that promise 'moksha' or salvation to the devout. Haridwar is situated 214 km northeast of Delhi, in Hardwar district in Uttaranchal, on a 3 km stretch in the foothills of the Shivaliks at the point where the Holy Ganges River emerges from the Himalayas. It is therefore, also known as 'Ganga Dwar' or the Gateway of Ganga. The city is associated with both Lord Shiva as well as Lord Vishnu. 'Har' means Shiva, 'Hari' means Vishnu. Pilgrims usually visit Haridwar before going on their pilgrimage to the Himalayan shrines of Shiva in Kedarnath and Vishnu in Badrinath. 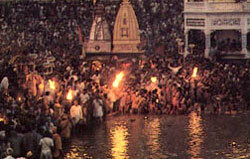 In the Hindu mythology, Haridwar is known as Kapilsthan. According to the legends, Prince Bhagirath of Suryavanshi clan performed severe penance and Lord Shiva, in response, sent the Ganges cascading into the earth from his matted locks. It was at this place that Prince Bhagirath's ancestors were burnt to ashes by the curse of the sage Kapila. Kapilsthan, a spot in Haridwar is pointed to as Kapila's hermitage. The ancient town is also mentioned in the books of Hieun Tsang the famous Chinese traveller who describes Haridwar as Mayura, on the eastern banks of the Ganges. The chief attraction here is the main ghat Har-ki-Pauri (steps of Shiva) believed to be the precise spot where the Ganges leaves the mountains and enters the plains. Lord Vishnu is believed to have left his footprint on a rock here. Bathing here is believed to cleanse the soul of all sins . Har-ki-Pauri was constructed by king Vikramaditya in the memory of king Bhagirath. Every evening at break of dusk, 'aarati' of the Mother Ganga is performed by the priests at the site, after which flowers and 'diyas' (earthen lamps) are set afloat on the waters of Ganga. The spectacle of hundreds of miniature lamps floating along the river is breathtakingly beautiful. Near by is the sacred bathing ghat of Brahma-kund where it is believed that Lord Brahma had performed a very elaborate 'yagna' in ancient times. There is a modern clock tower and some not so old temples in the venue. 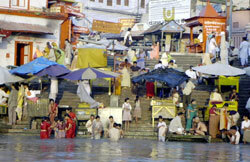 At this point, part of the Ganga is diverted to form a canal and Har -ki -Pauri lies on the west bank of the canal. There are five bridges across the river. Round the clock, religious rituals like ' upanayan' or the initiation rite, ' mundan' or the head tonsuring rite, ' asthi visarjan' or immersing the ashes of the dead and ' shraddha' or prayers propitiating one's ancestors are performed here. Further down there are more bathing ghats along the water front and one could see believers bathing, saffron clad 'sadhus' deep in meditation, 'pandits' worshipping the sun and dispensing wisdom. Haridwar is also famous for the Kumbh Mela held every twelfth year and Ardh Kumbh held every intervening sixth year when millions of Hindu devotees take a holy dip in the Ganga. The colourful Bara Bazaar and Moti Bazaar on the upper road, north side of the canal, lined with stalls selling images of deities, copper and brass puja utensils, sandalwood rudraksh and an assortment of goods, sweets, glass bangles, cane baskets etc are worth a visit. About one km. north of Har-ki-Pauri is a sacred pond known as Bhim Goda. It is said that Bhim once tried to mount a horse here, and the horse slipped creating a pond like crater which is the present day 'Bhimgoda Tal' or reservoir. Further north on the Rishikesh road is the Jairam Ashram with white sculptures depicting deities and demons and animated scenes from the Hindu epics are shown. Further ahead to the right is the Pawan Dham temple famed for its mirror work and elaborately dressed idols. Then comes the Lal Mata temple an exact replica of the Vaishno Devi temple in Jammu and Kashmir. On the southernmost hill of the Shivaliks is the Durga temple Mansa Devi, accessible only on foot (1 1/2 km) or chairlift. Near Haridwar are the towns of Mayapuri and Kankhal. The Pareswar Mahadev temple 4km south of Haridwar has a sacred lingam made of mercury. Kankhal, 2km further, houses the Daksheswara temple on the river bank, said to be the site of Daksha's yagna, which was destroyed by Shiva. Daksha, the father Shiva's first wife Sati, did not invite Shiva to the yagna ( sacrifice) and Sati burnt herself to death in anger. About 9km from Haridwar is the Rajaji National park, a haven for wild life lovers.